Italy, 1954, 100 minutes, Colour. Anthony Quinn, Sophia Loren, Henri Vidal, Irene Pappas, Ettore Manni, Christian Marquand, Gigi Perreau, Eduardo Ciannelli. Attila the Hun anticipated a lot of the sword and sandals Italian epics of the 1960s. At this stage of film production in Italy, a number of American stars were travelling to the country to appear in all kinds of films. At this time Kirk Douglas made Ulysses. Anthony Quinn had also appeared in Federico Fellini’s masterpiece, La Strada. Quinn was always at home in this kind of role, taking on a different nationality, going into war with sword waving – until stopped by Pope Leo I at the gates of Rome. Sophia Loren had made eighteen films by this stage but was only twenty. The film has a very strong international cast – but is matinee material, adventure style. 1. How entertaining, Interesting? Historical? Adventure? 2. The action historical adventure genre? Conventional situations, characters, crises, battles, luxuriant court etc? Usual material? Different? 3. The production qualities: colour photography, Italian locations, re-creation of sets in Ravenna and in the Hun camp, appropplate musical background? Special effects? Especially the encounter with Pope Leo? Empire? The decline of the Roman Empire and the reasons given? The place of the Church, especially Pope Leo? How credible for this kind of film? 5. 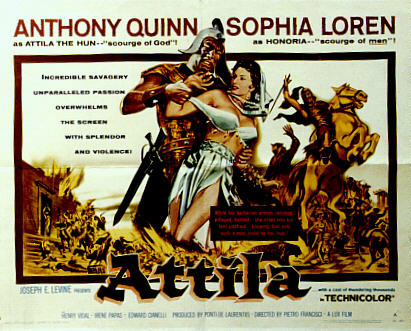 Anthony Quinn’s performance as Attila? The externals of the barbarians his place amongst the tribes, the loyalty of the troops, his relationship with his brother and yet his killing him, his children and the family aspects, his cruelty, for example the wrestling? His relationship with his wife, superstition? The friendship with Attila and his fighting against Rome? His relationship with Honoria? Leading his troops towards Rome? The confrontation of Pope Leo and its effect on him? Any insight into the barbarian leader? 6. The characterisation of the supporting personalities Attlus and the noble and loyal Roman, his diplomacy, death? His relationship with the Emperor Valentinian and his mother Gala Placidia? The character of Honoria and her place at the court, her ambitions, her spurning of her brother, her mother, her trying to seduce Attila, her negotiations with Attila and her death? Attila’s wife and her capacity for prophesying? Gala Placidia and her dominance of her son? Valentinian and his ineptness, his playing with the lord and grief at his death etc.? 7. The confrontation with Pope Leo and the narrative supplying the mystery? how convincing? 8. What were the memorable sequences? 9. Themes of the Roman Empire, the decline of the Empire, the invasion of the barbarians? Christianity and paganism? Civilisation?